Manchester United manager Louis van Gaal has ordered Ed Woodward to splash €100 million (£70.7m) on Bayern Munich striker Thomas Muller as the coach continues to search for a new striker, as reported by Metro. United currently have only Wayne Rooney and Javier Hernandez in their ranks as recognised senior strikers, with youngster James Wilson in reserve. Muller would now appear to be Van Gaal’s main target, having previously worked with the player during his spell in charge of the German giants, as reported by the newspaper. 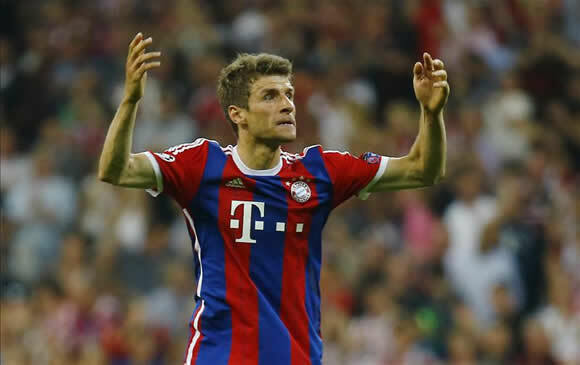 Furthermore, the Guardian report Muller is interested in joining the Red Devils and Man United are prepared to pay him £265,000 a week. The Red Devils have already signed Bastian Schweinsteiger from the Bavarian giants and Pep Guardiola will surely be reluctant to relinquish the 25-year-old who scored 13 goals in the Bundesliga last term, which is more than any player at Man Utd last term. If Van Gaal and Woodward could force through a deal though it would be a major sign on intent for the Premier League club who have already recruited the aforementioned Schweinsteiger, Matteo Darmian, Morgan Schneiderlin, Sergio Romero and Memphis Depay.